Kathryn joined us in this week’s blog topic, and we’re so glad to get a peek at how the first line of her novel came to be! In my chauffeuring years, when I found myself with an odd half-hour between dropping off one son and picking up the other, I’d swing into the local library and read first paragraphs. Any fiction would do, one after the other—Kidd, King, Kingsolver, Kipling—so that I could learn what worked for me, and what didn’t. By the time I wrote the opening line to the novel that would become my debut, The Art of Falling, I was quite the enthusiast. Who can settle for just one? Today I’m going to share, through several key iterations, the evolution of my novel’s opening. It’s the story of Penelope Sparrow, a 28-year-old dancer who wakes up in a hospital room unable to move, and unable to recall how she got there. When she learns that she landed on the car of a baker—parked below her balcony on the 14th floor of her high-rise—she must deal with the fact that the disappointing body she’d always blamed for ruining her dream dance career has ensured her miraculous survival. Each reveals something about my process in writing the book. The morning after, when I wake up, I’m in hell. This story came to me in present tense. Ultimately that didn’t work, but hey—hearing a first person narrator’s voice is a gift in any tense, so I took it. This first line established my character’s emotional plunge. Since midnight, Margaret MacArthur had sat in the Philadelphia Sentinel newsroom poised to approve final copy, her red pillbox still perched upon her head, red leather gloves, each finger tinged brown with age, lying across her narrow lap. By adding a prologue in the point of view of a secondary character, I hoped to establish an authoritative witness who could testify to the bizarre survival of Penny after her 14-story fall, but in the end, I found a better way. It’s Penny’s story, and I wanted it to start with her. Fourteen stories above the Avenue of the Arts, she began her final performance. This omniscient opening may have placed in a statewide contest, but it started the book in the wrong place. Penny’s dramatic drop from the balcony raised the question, “Oh no!—will she live?” You turn the page and…yup, she lived. Story over. The people who have asked me about “that night”—their euphemism, not mine—want to know if I can remember anything. This opening explored a telescopic approach: Penny is relating her tale from a safe remove at some point in the future. Ironically, since she’s speaking right to the reader, this approach was too detached. I danced at the edge of consciousness, hoping not to fall again into the woozy void. Closer. But her body image issues will already make Penny an unreliable narrator; I didn’t need to further compromise her account with pain meds from the get-go. Now that the company warm-up is over I return to the stage, where all things are possible. Rather than start with Penny’s great struggle, I’d tried opening with her love of movement, so the reader could bond with her. I ended up employing a hybrid approach. My muscles still won’t respond. Eleven first lines later, I came to the crux of the opening tension: Penny is a dancer who can’t move. Developmental editor Lisa Rector-Maass says a great first line does three things: shows movement, evokes emotion, and raises a question. I think these five words suggest accumulating effort, evoke the resulting frustration, and raise the question, “Why won’t her muscles respond?” The reader will be right there with her as she learns what happened to her. The manuscript may have gone through another half-dozen drafts, but this minimalist first sentence saw me all the way through to publication. Readers, what are some of your favorite first lines in books? How have your own works evolved over time? 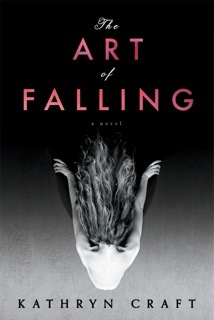 Kathryn Craft is the author of two novels from Sourcebooks: The Art of Falling (you can read an excerpt here) and While the Leaves Stood Still (due Spring 2015). Her work as a developmental editor at Writing-Partner.com, specializing in storytelling structure and writing craft, follows a nineteen-year career as a dance critic. Long a leader in the southeastern Pennsylvania writing scene, she speaks often about writing, and blogs at the Blood-Red Pencil and Writers in the Storm. The evolution of your first line is fascinating. I adore the line you settled on. I also really liked the line: Fourteen stories… But I think you nailed it. I had a similar process. Each of my first lines represented where I was with my craft and in the development of the story. Looking forward to reading and congratulations on your release! Thanks so much for having me, Heather, and I’m thrilled for your and your mom’s interest in my book! I’m so glad Natalia suggested this prompt—I loved her post on it as well and am now going to go back through and read them all. As you can see from my post I’m quite the first line junkie! So excited to have you as our guest today, Kathryn! My husband tells me my copy of The Art of Falling awaits me back home…can’t wait till I’m back in Austin so I can start reading! Hi Kathryn! First off, let me say what a wonderful Facebook launch party you had–wow. That was a marathon launch party! So you know how when you first write a novel everything seems to take so long, but then after a few years of working on it you’re like, “Oh, change from first person to third. That should only take me three months!”? I had that kind of week! On Tuesday time suspended during that nine-hour launch, I really had no sense of it as I talked about my favorite subject—books!—with such interesting people. Then on Thursday I drove two hours to tape a three-minute TV spot—haha! Time warp all week. Yes, I was a dancer and a choreographer, so it was a write what you know scenario. Plus, I thought all the rejection suffered by a sensitive individual in a creative career could really set the stage (so to speak!) for my protagonist’s downfall. I’ll peek back for any other comments later—off to another launch event! This is such an interesting breakdown, Kathryn–and very timely for me to hear about it today. I love the breakdown of a first line: shows movement, evokes emotion, and raises a question. I’ll be incorporating that today as I work. Thank you so much for sharing this inside look! Kathleen—I can’t recommend that library technique enough! You’ll get a lot from it. Glad it’s of use and I look forward to reading your “final” first sentence! I’m going to have to buy your book. It’s my type of read. I’m agonizing over the opening line for my book right now and this is helpful. Thank you. Thanks, Patti, I’m thrilled to hear the concept connects with you! Good luck with your first line—I think part of the reason we agonize over them so is that they are just so much fun to write. What other sentence in the book will command so much attention? Thanks for the comment, Barbara! Isn’t it funny that in the end, the best was the simplest? I just needed to really know my book to find it. You must keep all your notes Kathryn. I couldn’t tell you details like that about my stories’ evolution. I feel like opening up all my books and checking out all the first lines. I will have to read your book. I am a horsewoman (a barrel racer) and fell off my horse last year and broke my back. Trying to get back to riding this spring but don’t know if it’s going to happen. Still, it could have been a lot worse. My head bounced twice but luckily I wear a helmet nowadays. I’m alive. But I’m soft and weak now and I don’t like it.